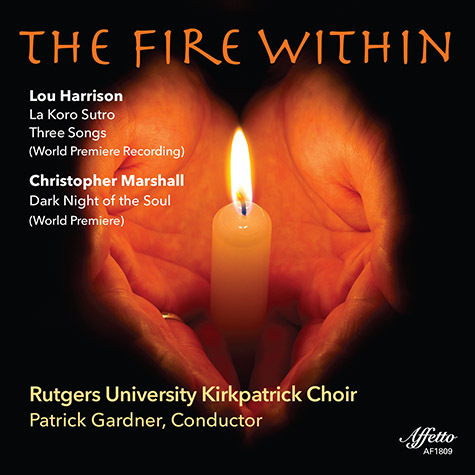 This live recording features the New Jersey Chamber Singers 40th Anniversary concert celebration. 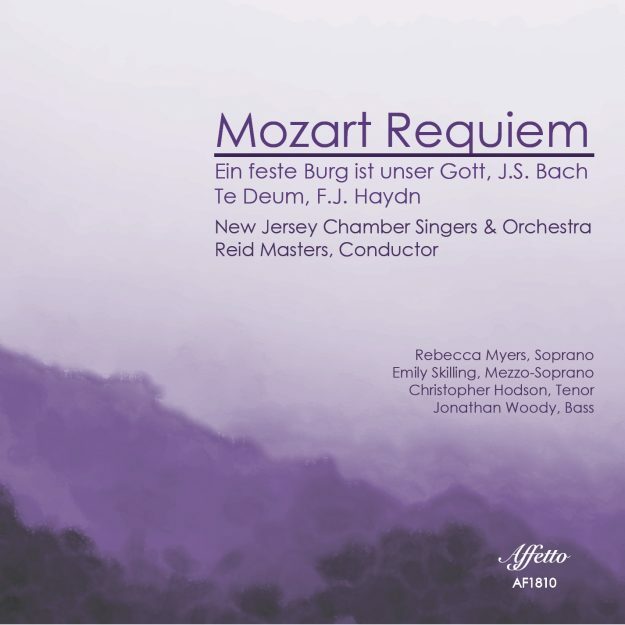 The program is anchored by the Mozart Requiem and also features festive works of Haydn’s Te Deum and Bach’s Reformation Cantata, Ein feste Burg, because 2018 also marked the 500th anniversary of the Lutheran Reformation. While it is more common to hear these works performed by larger ensembles, this historically-informed performance honors the repertoire’s intimacy by only employing 32 voices and a similarly sized orchestra. All three pieces on this album were touched by hands beyond those of their composers. While many purists have worked extensively to cleanse iconic works of foreign elements, this performance embraces them. Bach’s Ein feste Burg proudly features the extra parts for three trumpets and timpani added by his son, Wilhelm Friedemann Bach. Haydn’s Te Deum was written for Empress Marie Theresa even though he was employed to write music for the Esterhazy court in Eisenstadt. Even though the complete autograph is lost, trombone parts were later discovered to have been written in the hand of his copyist, Johann Elssler. So, it is probable that Haydn delivered a large-scale work including three trombones and three trumpets to the Empress, even though he performed a slightly down-sized version of the same work in Eisenstadt to accommodate the orchestral forces available to him. This recording boasts all extant parts. Finally and most famously, Mozart’s Requiem was completed by Süssmayr following his death in 1791. This album honors a perspective in which early music is still a living art that is capable of change and worthy of exploration. The germ of the concept of this album for Ellen Rose, the recently retired first chair violist of the Dallas Symphony, and Kristin Ditlow, conductor, pianist extraordinaire and vocal coach, came due to a musician-colleague’s invitation to the duo to perform during the 2012-2013 season at the National Theater in Kunming, China (Yunnan Province), and the multi-city tour formed around that. The three-week tour of Beijing, Shanghai, and Kunming became the framework represented by this duo’s debut disc name, Providence. What followed immediately was the weaving together of three continents and years of planning out of the repertoire of that tour. Boccherini’s Sonata No. 6 in A Major is representative of the composer’s bringing violincello writing into more melodic and virtuosic milieu, here represented so wonderfully by a viola. Vaughan Williams’ Romance is among several pieces discovered after the composer had passed away in 1958, but thought to have been composed in 1914. 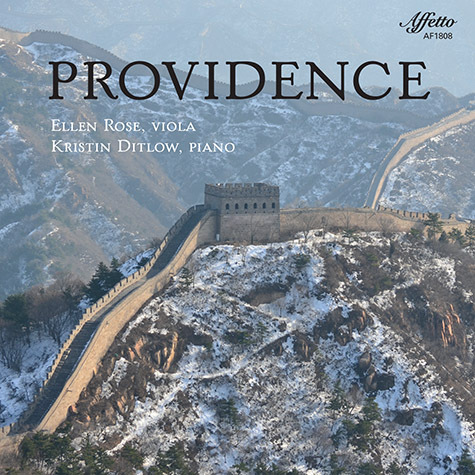 “Whither Must I Wander,” originally for piano and baritone from his song cycle Songs of Travel, was arranged for the duo on this album by Ellen Rose and Kristin Ditlow, and is therefore a premiere recording. Enescu’s Concertstück is a combination of his native Romania and Paris where he lived much of his life, with traces of Debussy and French impressionists and the theme from a lively Romanian folk dance. Messiaen’s “Louange,” composed in a French prison in 1941 for a quartet of musician prisoners, uses religious quotes or motives as well as bird calls, Messiaen being both a devout Catholic and an enthusaistic ornitholgist. Rebecca Clarke’s Sonata was the largest work on the China tour, her best-known work, and was written for a 1919 competition, in which she tied Ernest Bloch for first place with its combination of whole tone, octatonic and pentatonic scales as well as piano and string writing which shows great admiration for Debussy. Ending the album with a Puccini aria from Tosca coincides with using this piece as the encore from the China tour, an aria which has, as its sung last line, “I lived for art, I lived for love, I’ve never harmed a living soul!” There is no doubt that this album musically soothes and excites the soul with a vast combination of exquisite musical textures and stunning performances! 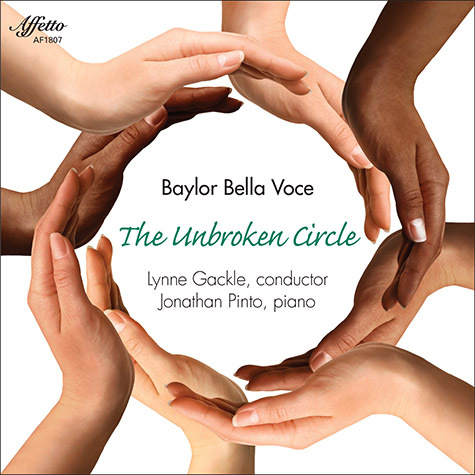 Bella Voce is the select women’s ensemble at Baylor University. Organized in 2011 by their conductor Dr. Lynne Gackle, the ensemble performs a wide and interesting variety of choral selections, reflecting various style periods and genres from the vast choral repertoire featuring women’s voices. On this, the ensemble’s second CD, the selections are a stunning and complex presentation of classic and modern pieces, from Mendelssohn to some of the most brilliant new choral composers on the scene today, sung by one of the finest women’s ensembles in the nation, collegiate or professional. Our summer 2018 releases – “La Raphaele – The Art of Francois Couperin” / “Le cor francais authentique (The Truly French Horn)” / Poet’s Journey – Song Cycles of Benjamin Britten / “Voices of Women – From Unknown to Renowned” / Dvorak – Cello Concerto in B minor, Op. 104 and other works. Antonín Dvořák’s concerto for cello and orchestra is arguably one of the greatest works for the solo cello, but more importantly, one of the greatest large-scale works ever composed. 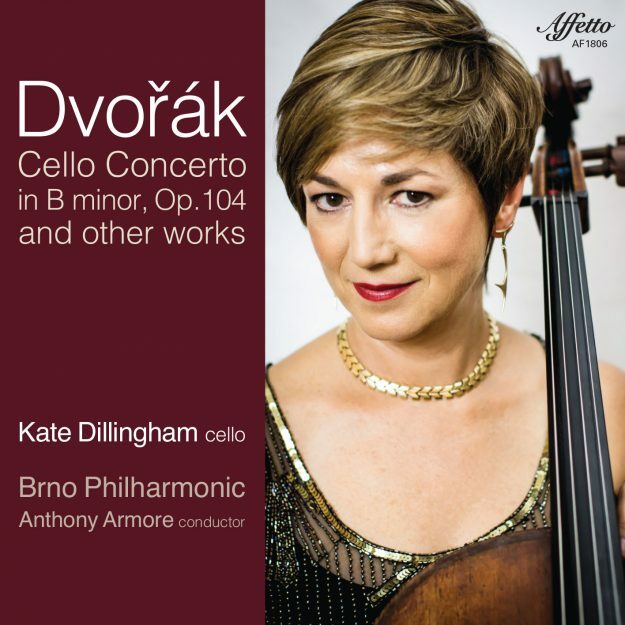 Cellist Kate Dillingham, “…an excellent cellist: dignified and compelling…an extraordinary performer.” is the soloist with the Brno Philharmonic, Czech Republic in this exciting new release. In the opening bars, the listener is invited immediately in to the heart of the composer’s creative powers of invention. Recorded in the beautiful Besední dům, in Brno, Czech Republic, the phenomenal acoustic and superb artistry of the Czech musicians in their beautiful collaboration with Ms. Dillingham display the full range of color and allow the most profound human emotions found in music to flow forth. The cello concerto differs from Dvořák’s previous piano and violin concertos given the important role of the orchestra, which is an equal partner to the solo instrument throughout the work. In the solo part, Dvořák made remarkable use of the varied and rich sounds the cello can produce, and, its unique ability to convey broad, singing melodies. Dillingham’s beautiful tone and fine musicianship bring a fresh interpretation to the grand scale heroism contrasted with the profoundly poetic world expressed in Dvořák’s iconic work. Included on this album are two short pieces Dvořák composed for cello and piano. Due to their immense popularity with listeners, the composer arranged them for cello and orchestra. Tranquility, melancholy and a burnished quality characterize “Silent Woods” op. 68/5, in contrast to the energetic and delightfully playful “Rondo” Op. 94.